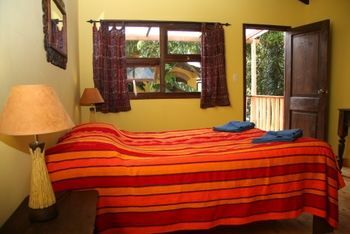 Come join us under the volcanoes where you can learn to dive, swim in a volcanic lake, study Spanish, hike to waterfalls, volcanic peaks and neighboring Mayan villages, or simply lie in a hammock and enjoy doing nothing at all.Our rooms range from simple to downright luxurious. There's space for around fifty people the last time someone found the energy to count, and our newest rooms are suitable even for those above 30! We've got three dormitories with 22 beds in total, several single/double rooms and even some triples. Several shared bath facilities are on the grounds so you won't have to wait in line, and yes, the showers are HOT!When the Iguana opened back in 1996, the set up was humble and homey. We had no electricity and no hot water and people, like, you know, talked to each other! While we have moved into the 21st century along with everyone else, we do try to keep the original spirit of the Iguana alive and that’s why we don’t have Wi-Fi. We understand that part of traveling is checking email, booking flights and accommodation and Skyping with your family and friends back home. So we do have a computer room where you can access the internet for next to nothing. But we firmly believe that one of the best things about traveling is the connections you make with fellow travelers and let’s face it if you’re head deep in your Facebook account all day you’re probably going to miss some cool connections and not to mention the beautiful sunsets over the volcanoes! From 8AM - 3PM daily our lake front restaurant offers breakfasts & lunches aimed to satisfy the hungry traveler. Egg dishes, crepes, fruit, sandwiches, salads and our famous licuados are just some of the options you can choose from. We make as much as humanly possible from scratch (from our bread to our pad thai sauce) and all our fruit and vegetables are locally bought and grown.Dinner is served at 7:00 and the fixed menu is a delicious 3-course meal consisting of soup with homemade bread, a main course (vegetarian option always available), and coffee, tea & cake for dessert. Our family-style dinners often lead to hours of storytelling, board games, very bad jokes, guitars & sing-alongs and are often noted as one of the highlights of people’s time here.Saturday nights at La Iguana Perdida are somewhat legendary on the backpacker trail. On Saturdays we have our famous costume dress-up party and BBQ. We serve marinated chicken or veggie burgers and a huge buffet of side dishes and salads, followed by our famous chocolate brownies.The bar is open every day and night for sodas, beer, wine, spirits, home-made liqueurs and flavoured vodkas. Sunday through Thursday happy hour runs from 6pm - 7pm and on Fridays and Saturdays 5pm -7pm. We are also home to the only dive shop on Lake Atitlan. ATI Divers can get you qualified to dive, extend your skills with an altitude specialty or simply take you on a fun dive. 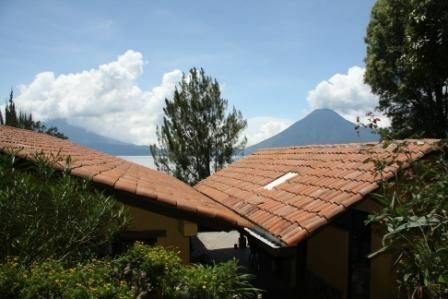 Lake Atitlan is a volcanic crater lake so it’s something fun and different for those feeling intrepid! Volcanic rock formations and hot spots along the fault line are just some of the cool things to experience under the water. There are plenty of hiking trails, classes of all kinds, yoga, Pilates and weaving just to name a few, kayaking and local markets to visit so you’ll have no reason to have nothing to do unless that’s what you want!Amazing views, delicious food, clean rooms, great diving, and world-class laziness are all here waiting for you! We are just off the public dock in Santa Cruz, a 15-minutes boat ride from Panajachel. If you're looking to come by bus you'll be waiting a while as our village has no road.